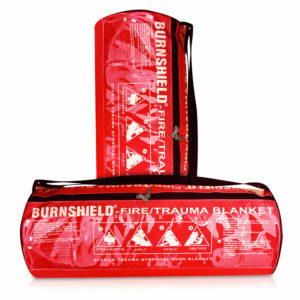 Burnshield’s original ground-breaking product, Fire Trauma Blanket was developed in conjunction with the Wool Board and the CSIR for the emergency services market. This versatile application is used as protection for rescue workers entering or leaving a fire area. It can also be used to extinguish flames on a burn victim and, if necessary, be used a large dressing, providing instant pain relief and begin the healing process while victims are being transported to emergency care units. The Blanket is made from 100% wool and is woven into a specially designed interlinking cellular structure for maximum effectiveness. The flexible shoulder barrel-bag allows for hands free portability and storage.